Join us to flyer the public during Day 1 of AFM live TV negotiations on Monday, July 9 from 9 AM – 12 PM outside the ABC offices at 47 West 66th Street. RSVP to the week of action here. Musicians who perform under the AFM live TV contract are not paid when they appear on ad-supported streaming, even though other performers are paid. After 18 months of negotiations, in December the networks finally agreed to discuss paying musicians for ad-supported streaming. As we return to the negotiating table, musicians and our allies are coming together to show the networks that we will continue fighting to ensure musicians are paid fairly! 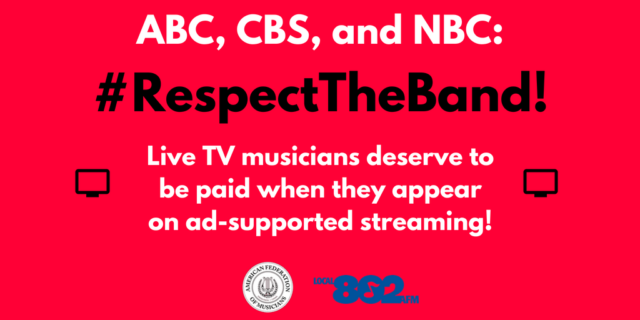 Tweet at the networks telling them to #RespectTheBand!